Our mission is to provide diapers and incontinence supplies to children and adults through community partners. We envision a community where every diaper need is met. We know that people and families who need diapers probably need other social services as well. Instead of reinventing another social service delivery system, we provide diapers to existing organizations that work with people in need. Our partners include: crisis nurseries, domestic violence shelters, senior centers, and congregations for a variety of religious affiliations. One task is to conve rt our community's compassion into action on behalf of those in need by increasing awareness of the issues facing vulnerable populations. 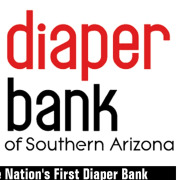 Would you recommend Diaper Bank of Southern Arizona? The Diaper Bank is a great example of a grassroots community service organization doing work of enormous importance right in our own community. The work done by and through the Diaper Bank impacts peoples lives for the better. It's a shining example of a small agency working cooperatively with other groups to make where we live a better place. Volunteering at the Southern Arizona Community Diaper Bank was one of the greatest experiences I've ever had. I worked side-by-side with top management helping the Diaper Bank distribute hundreds of thousands of diapers. The Diaper Bank's volunteers are the essential bridge that provides hope for families and babies living in crisis situations. The best feeling is seeing families smile because you made a difference for them, and thousands of people just like them. You'll make many new friends and gain new leadership skills. Volunteer today at the Diaper Bank! You're going to love it! The Diaper Bank has a volunteer focused approach to meeting the organization mission. With the organization having only one paid employee volunteers have the opportunity to have major community impact. If you are looking for an opportunity to change the world, here is your chance.